Apparently there is some sort of loophole at the local level that doesn’t quite jibe with the rest of the country’s criminal laws. So, the same old tired PRI, PRD and PAN politicians discuss and argue about the trivialities and stupidities they argue about, usually involving funding of something or other, while this charming and little known (until this latest case brought it up) problem lies waiting for another life to be lost without consequence. Imagine the impact on a previously unknown segment of the tourism industry! Their slogan could be: If you are 17 and want to kill someone, no problem! You don’t have to enlist in the Marines and go through all that training to go to Iraq, just come to Merida and fulfill your fantasy without fear of consequence! Stab ’em, rob ’em, kill ’em. No problem. Merida – the Red City! Of course this could wreak havoc with other tourism industry market segments, like all those gringos who have come down to buy old houses and inflate real estate prices, retiring and all that. I am hoping that enough gringos read this before coming to Merida and that they will think twice about it; hopefully the tourism sector will protest with the potential in lost revenue and something will be done. In the past, my little website has been criticized by a few ignorant locals who think that it causes economic harm to the Yucatan. Well I hope this particular news item DOES cause economic harm and makes all the idiot politicians get their priorities straight. Only in Merida can you Flip off a Cop and Get Away with it! This just in. This week, a little note appeared in the local Diario de Yucatan newspaper, that bible of all things Yucatan, in the Policia section, one of my favorites. Turns out that a lady told off a Puma which, in the Yucatan, is not a large cat but a division of the local state police. If you live here you’ve seen ’em; they’re the ones that ride around on motorcycles in dark blue uniforms with a machine gun strapped to their backs, wearing extra-dark sunglasses. The Puma in question didn’t like the lady’s tone and asked her to pull over; she ignored him, closed her car window and sped off. The cop gave chase and again asked her to pull over. She again gave him a piece of her mind and sped off yet again. The frustrated policeman called for backup and with the help of another two motorcycle policemen tried to get her out of her car, but she refused. When they were about to proceed to the next level, which in this case was getting the car onto a tow truck with the driver inside (this is done here, not to worry) another fine, upstanding lady appeared to appeal on the first woman’s behalf. She apologized and said the lady was a little nuts (duh) and that she (the second lady) was a friend of the Chief of Police, Don Javier Medina and that she was a member of the PAN party (the party in power in the city and state government at the moment) and that she would take the lady home. Amazingly (can you see this happening in Philadelphia or Innsbruck?) the police backed off and let the two go! This is really a great country! Not only can someone who is obviously out of their mind drive a car, they can also mouth off to a policeman and then have some influential friend get them off. The people from the PAN complained ad nauseum when this happened in Mexico’s PRI (the former ruling party) years; now they are doing the same thing! So those of you thinking about retiring in Merida, come on down! It’s a wonderfully lawless land where anything goes! In fact it’s amazing that anything gets accomplished at all! Gumby aka Gambi in Merida! 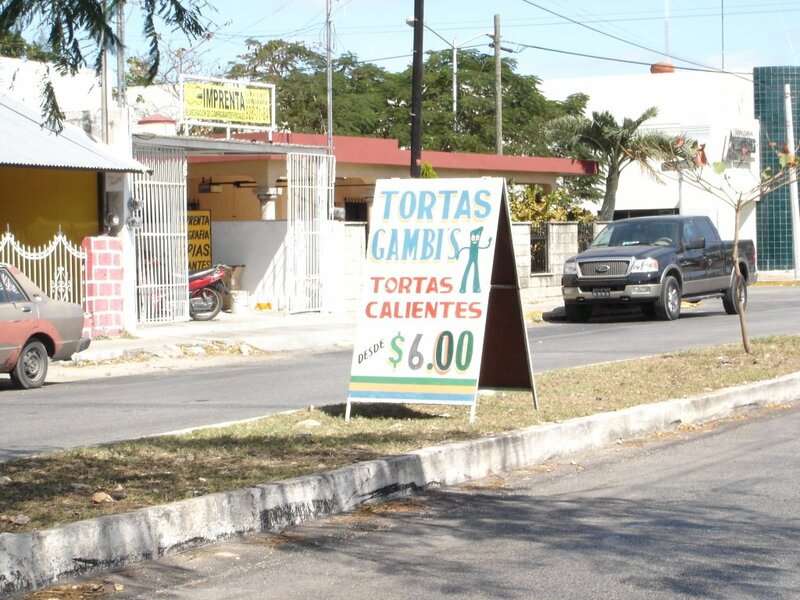 On a recent drive through the area, I found this sign for a torta place in the Plaza Fiesta neighborhood. The name looked and kind of sounded familiar… and lo and behold, it is our elastic green childhood friend Gumby! The sign says Gambi but the misspelled name didn’t deter me from stopping and finding out what Gumby’s name and likeness is doing on a sign for tortas calientes in Merida. Well much to my surprise who should open the door of the sandwich place but Gumby himself! Leaning on a yellow rubber cane, but in otherwise apparent great health, he asked me in and prepared a torta cubana for me as he told me of his latest adventures. It turns our that our Gumby aka Gambi is getting on in years and is retired permanently from television. “It was Scooby Doo that started it” Gumby says, slicing a red onion. “the animation just kind of went downhill after that.” Green tears begin leaking down his green cheeks. “Don’t get me wrong; I’m glad I got out when I did” he says and then adds “it’s the onions”. After seeing his program decline in the ratings department and having it reduced to occasional showings on retro channels like Nickelodeon, Gumby took a long hard look at his career and decided that he had had enough. He asked his friend what he tought of the idea of retirement. Pokey was being auditioning for a small, but pivotal part in a new Nick Park flick and so was not as pessimistic and tired as Gumby, and told him as much. It was then that Gumby came to a decision. He would take his earnings from years of being stretched thin on U.S. television and move to someplace relatively close but still far away enough to feel like he was in a different world altogether. Gumby finishes piling pierna, ham and cheese on the open faced baguette and drops the other half of the bread on top. His one giant green finger group is slick with grease from the pierna. He smiles, that Gumby smile we all know and love. “The secret to a good torta, you see, is to heat it like this” he says as he crushes the torta under a heavy smoking hot metal sandwichera. However, At first, Gumby found the hot Yucatecan climate disagreed with his body and found it hard to adapt. “It was so hot when I first came here that I would find myself bent out of shape many times” he exclaims, rolling his eyes as he recalls those early days. But then, air conditioning became more and more common and soon Gumby was completely acclimatized. Taking out my wallet to pay for the torta. Gumby waves it away. “Don’t worry about it”. I thank him and shake that funny hand of his. Who would have dreamed that Gumby would end up in Merida? Amazing little town, this. Looking throughout the internet for some mention of the events a day ago, I typed Merida, Yucatan and bomb. Nothing appeared except some real estate sites declaring in that fake enthusiastic way that real estate ads do, that Merida was “da bomb”. In fact, there was a real bomb in Merida yesterday – or was it the day before? – two grenades were tossed into the local office of the Por Esto! newspaper here in Merida. Yes, Merida. Grenades. Sounds incredible, but it happened. The narco violence that has been creeping steadily south for the last couple of years has reached Cancun; there have been at least 5 narco-related assasinations in the last few weeks. The governor of the state of Quintana Roo assures everyone that this is only narco-on-narco violence and that the general populace should not be alarmed. Yeah right. Unless you happen to be in the path of a stray bullet at the disco or in some supermarket or a hotel lobby. Now that violence has finally reached Merida. The Por Esto! paper is a bold-headline newspaper that uses every opportunity to publish shocking and provoking reports that no other newspaper down here would touch. I have no idea if what they write is true or false; apparently they have pissed off someone with a violent streak and after a similar explosive incident at the Por Esto! offices in Cancun, it is Merida’s turn. Used to be you would read about all the violence up north and be thankful that you were in the Yucatan, donde no pasa nada. Well, it’s time to reassess the situation. Yesterday, September 1st, the continuing saga of the Mexican presidency vs the irrational, irrascible and incorrigible PRD AMLO, well… continued. The president arrived at the legislative chamber known as San Lazaro to present his report to the nation (informe) but found it impossible to even get to where the microphones were, since the whole presidium or whatever you call the tribuna in English was blocked by PRD legislators. While the politicians on the floor sang the national anthem, the PRD guys just stood up there with their arms in the air like the simians they are, making V for Victory signs with their fingers. So Mr. Fox just handed in the report to the legislators and left. 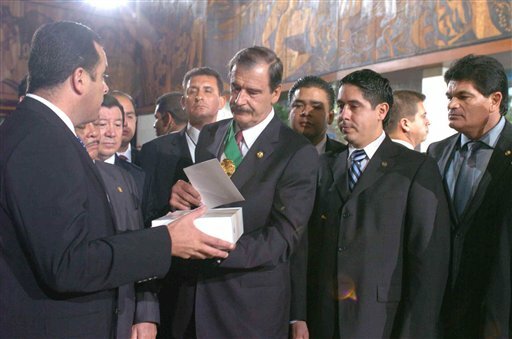 The trampled and violated Mexican constitution states that the president has no obligation to actually read it; just hand it in. So that’s what was done. It is a boring tradition anyway, where all the wonderful things that have happened in the last six years, the one-term mandate, are read by the president until his audience becomes glassy-eyed in boredom. The televised informes have been getting progressively louder and out of control, as legislators from the opposition parties have become increasingly vocal and irate. Especially the PRD. This time, they went so far as to not let the president speak at all. Mr. Fox then went on national radio with a previously recorded speech, indicating that he knew that this was going to happen. It was a non-event after all that speculation. The country awaits, with baited breath, the grito, which should definitely be more interesting.